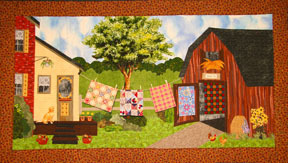 Great Lakes Seaway Trail/ Sackets Harbor, N.Y. - Seaway Trail, Inc. has announced that its byway-themed quilt show will now be held on a biennial schedule with the next event scheduled for 2015. Since 2001, the event, held in Sackets Harbor, NY, has showcased quilting as a cultural heritage theme for traveling the 518-mile-long Great Lakes Seaway Trail. The biennial scheduling in part will accommodate the even-year biennial dates of the nearby North Country Quilt Guild Quilting Show held in Clayton, NY. The North Country Quilt Guild&apos;s next event will be held June 6-8, 2014. The theme for the 2015 Great Lakes Seaway Trail Quilt Show is Vineyards, Fields, Farms and Food. Past Great Lakes Seaway Trail Quilt Shows have featured favorite Seaway Trail places, lighthouses, Great Lakes fish, birding, the War of 1812, the museum heritage quilts found at attractions on the byway, the byway&apos;s Amish quilting communities, and quilters from the 11-county waterfront region in New York and Pennsylvania who have published designs. The first show was a one-woman show by Mary Knapp, who published her first book of designs in 2013. Photos and a history of the show are online at www.seawaytrail.com/quilting. The National Scenic Byway Great Lakes Seaway Trail offers unique land and freshwater travel opportunities along Lake Erie, the Niagara River, Lake Ontario, and the St. Lawrence River. Quilters find fabric shops and quilting workshop events throughout the byway region. Along western Lake Ontario, the 22-mile Orleans County Country Barn Quilt Trail loop tour and audio tour starts off the Great Lakes Seaway Trail at Partyka Farms in the Town of Kendall and takes travelers to more than 50 buildings with painted quilt patterns. Those interested in participating in the 2015 show as quilters, sponsors, vendors or volunteers may contact show manager Lynette Lundy-Beck at 315-646-1000 x203, lynette@seawaytrail.com. Contact: Quilt Show Manager Lynette Lundy-Beck: 315-646-1000 x203 Great Lakes Seaway Trail President/CEO Mike Bristol: 315-646-1000 x202 Publicist Kara Lynn Dunn, 315-465-7578, karalynn@gisco.net Photo: This quilt by Louise Furber of Phelps, NY, illustrates the rural theme set for the next edition of the Great Lakes Seaway Trail Quilt Shows, now to be held on a biennial basis.